Some anecdotal experiences on yoga and inguinal hernia exercises. 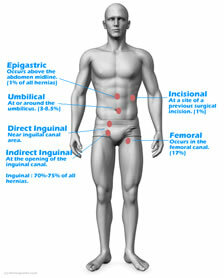 What practical steps can you take once you have been diagnosed with an inguinal hernia? The obvious one we endorse is elective surgical repair but the surgical appointment system (at least in the UK) can take time and while you are waiting there are a few things you can do to help yourself. One of these is Yoga. This ancient discipline of breathing, meditation and postures has thousands of years worth of physiological practise to fall back on and might be worth a try. However, Yoga can only be beneficial if you have a reducible hernia. If it is large or irreducible then yoga will not help. In this article, we are going to talk about the benefits of yoga while you are managing an inguinal hernia. We are not looking at a cure or complete hernia recovery with yoga, which is a much more contentious subject. I will give you some personal viewpoints as a new yogi who reluctantly stepped into a class a few months ago. Although I don't have a hernia, working in the medical garment industry ensures that you have a healthy respect for your own bodies limitations with age. I realise that I am in the population cohort most vulnerable to inguinal hernia; male and mid-fifties and I strongly believe that prevention is better than cure. Firstly, you are not alone, there are a lot of men doing yoga classes. (The ratio in my class is about 1 in 4 and they are mostly middle-aged). All you need is a mat and some comfortable clothes and an open mind and you are ready to start. If you do it properly you will feel like have done something physical, particularly if you attend class in the morning I can guarantee you will have a good feeling for the rest of the day. I would advise that you tell your yoga teacher that you have a groin strain or injury so that they understand that you may not fully extend or complete all of the stretches and poses in the class. That done, you just need to go easy to start with and listen to your body. Warm your muscles up with a gentle walk or stretch before you start the class. The first few hours of anything new will feel difficult. Just go with the instructor and retain an open mind. One of the key benefits of practising yoga regularly is a stronger abdominal wall and much better flexibility; you forget how stiff your joints get as you get older. As Inguinal hernia is a direct result of a weakness in the abdominal wall muscle then this must be the primary benefit of yoga when you have an inguinal hernia. Improvement is easy to see because you do the same asanas (poses) regularly, you realise that your body is getting stronger, you can hold the pose longer and stretch further with repetition. There are particular poses that will work on abdominal wall muscle development but you will do a series of related asanas throughout the class. All of these abdominal poses will assist with hernia exercise. Add some mindfulness to your life. Not particularly spiritual and no understanding of what 'mindfulness' means? Me neither, but I was so relaxed at the end of my first class that I almost fell asleep. My mind was definitely 'decluttered' and I had more energy for the day ahead and those same positive feelings continue whenever I finish a class. So whatever it is, it seems to help. Breathing seems such a normal 'activity' that it seems irrelevant, we have to do it but we don't think about doing it. Yet you will get time to concentrate on this in a yoga class. This 'clearing' of your thoughts and day-to-day to-do lists is liberating, if only for a few minutes, so go with it. Test yourself on new poses. I did a headstand for the first time in 45 years recently! It felt good and a few minutes a day is great for all sorts of conditions. While your yoga instructor will show you all sorts of frankly mind-boggling poses there is always an easy path to attaining that pose and then a correspondingly more difficult one. You get to choose what path you pick and you only compete with yourself. What academic studies have been done on the effect of Yoga on patients with an Inguinal Hernia? I will be continuing my own yoga practise as I get so much out of it, I hope I have encouraged you to try. As a preventitive measure, I think it is second to none but we would be interested in hearing the experiences of customers who have done yoga with an inguinal hernia? Your experiences of yoga with an inguinal hernia.